Download a blank fillable Dd Form 149 - Application For Correction Of Military Record in PDF format just by clicking the "DOWNLOAD PDF" button. 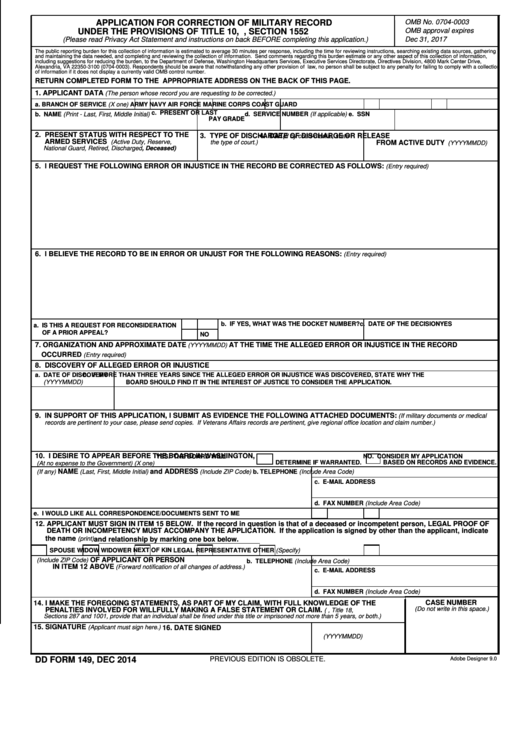 Complete Dd Form 149 - Application For Correction Of Military Record with your personal data - all interactive fields are highlighted in places where you should type, access drop-down lists or select multiple-choice options. RETURN COMPLETED FORM TO THE APPROPRIATE ADDRESS ON THE BACK OF THIS PAGE. b. IF YES, WHAT WAS THE DOCKET NUMBER? BOARD SHOULD FIND IT IN THE INTEREST OF JUSTICE TO CONSIDER THE APPLICATION. BASED ON RECORDS AND EVIDENCE. e. I WOULD LIKE ALL CORRESPONDENCE/DOCUMENTS SENT TO ME ELECTRONICALLY. and relationship by marking one box below. PENALTIES INVOLVED FOR WILLFULLY MAKING A FALSE STATEMENT OR CLAIM.